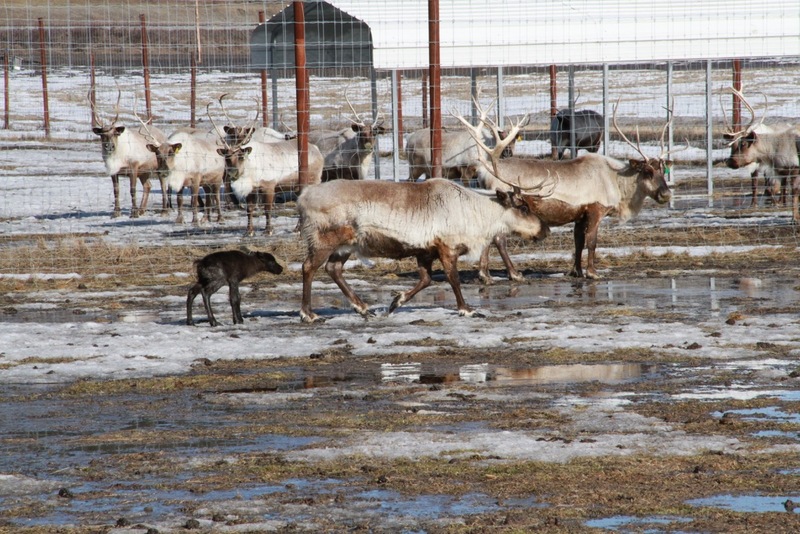 Reindeer calf 1603 trails its mother at the Fairbanks Experiment Farm fields. See the short video link to the calf. Reindeer calf 1603 arrived sometime early today, the first calf born this spring at the University of Alaska Fairbanks Experiment Farm. Animal caretaker Erin Carr said, when she arrived at work this morning, the calf was lying on wheatgrass in a pen in the fields opposite the Georgeson Botanical Garden. Its mother, Mini Me, hovered nearby. “He’s up and active,” said Carr. The male calf weighed in at 15.6 pounds, an average size. While visitors watched this afternoon, the calf struggled to its feet for a snack. Altogether nearly 30 calves are expected this spring. The herd is used for research through the university’s Reindeer Research Program. Carr said, in the five years she has been with the program, the first calf has been born on April 5 three times. As is tradition, schoolchildren are invited to name the calves. Sometime late this summer, the Reindeer Research Program crew will match prospective names with the calves, based on personality and appearance. The link to submit names is on the reindeer program website at http://reindeer.salrm.uaf.edu.